In this historical thriller, three Americans find themselves transported to ancient Egypt and thrust into the political intrigue of the day. Tim Hope is an American tourist trekking through Egypt forlornly, anguished over the death of his fiancee. Two Americans he’s befriended wander off to explore the Tomb of Kanakht and mysteriously disappear. Concerned for their safety, Tim searches for the couple, Brian Aldwin and Diane Maclaine, but instead unwittingly steps through some sort of portal and travels back in time 5,000 years to an Egypt before the pyramids and the age of Moses. Tim discovers that Brian and Diane stumbled into the portal as well, and all three are suspected by some to be gods, a perception reinforced by heroic deeds performed by Brian and Tim. Problematically, the world they now inhabit, Kemet or The Two Lands, is rife with intramural conflict. After suffering seven years of a devastating famine, King Djoser’s reign is threatened by secret rivals, including those close to him who claim loyalty. Further, Tim’s and Brian’s lives are menaced by political forces that fear their popularity with the people, the consequence of feats of bravery and compassion. 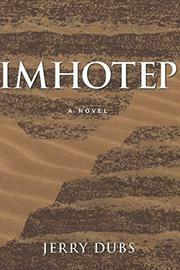 Tim, adopting the name and role of a famous architect and adviser to the king, Imhotep, risks his life to properly direct the course of history. Meanwhile, all three Americans are drawn to this unfamiliar way of life and have to decide if they wish to remain indefinitely or—if they can figure out how—return to the future. This is the first installment of a four-part series by Dubs (Vagabond Retirement, 2017, etc.). While the undergirding premise of the plot is wildly fantastical, the author has a peculiar talent for rendering the implausible in credible terms. In addition, the depiction of ancient Egypt is masterfully executed, both authentic and accessible, with the narrative including Tim’s descriptions of the landscape (“He saw in the distance the green of the Nile’s valley, richer and darker and fuller than he remembered it. And along the river, rising from its banks he saw a city of mud brick homes surrounded by a thick white wall: The long-dead city that Tim knew as Memphis”). But the real draw of the book is its characters, especially Tim, drawn in lushly substantive terms. An intelligently constructed and exciting peek into the distant past.